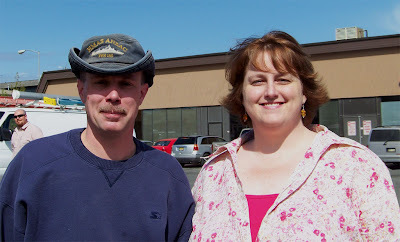 Just came back from Wasilla, where I met UCFer Jeri for coffee. She's a charming and funny person and we had a very nice conversation. Oh, and she purchased one of my bowls, so woohoo and so on and so forth. We took a picture with her camera (since I'd forgotten to bring mine along). When she emails it to me I'll post it here, because I know how you people are with the whole proof thing and all. Here we are. I think we did reasonably well, considering that we were staring directly into the sun and the person taking the picture kept saying "don't squint, don't squint." Note: Tall women, tall, read my blog. Just saying. Either that or I'm losing bone mass in my dotterage. That's an Alaskan Birch burl. It is an extremely cool piece, with birdseyes (those swirling features on the lower right side), spalting (the black lines), and fire-like yellow rays up the inside. It's a natural edge turning, leaving some barkwood along the irregular, scalloped rim. I will post several pieces that I have for sale tomorrow, some are nearly as cool as this one. Nearly. You didn't give Jeri another headache, did you? Senior Chief, as you well know coffee cures headaches. Lack of coffee causes headaches. I had a large, large coffee so I feel pretty damned good - and speedy. Besides, I was nothing but sweetness and light - as are all Warrant Officers. Ah, the UCF Pacific Northwest Branch. I'm pretty sure you're the most active sector...at least in meatworld. It was great to get a chance to meet Jim in person - he's warm, personable and a fabulous storyteller. The ranting, cranky persona evident in some of his blog posts was nowhere in sight. The bowl I bought - and it was a TOUGH choice among several beautiful options - is great, I'm looking forward to finding a place to display it when I get back home. I was only able to pull the pic of he and I off my camera - said pic has been sent along for posting - and won't be able to bowl-blog until I get back home. Thanks, Jim, for making the time to meet up face to face! I'm so jealous of all you people meeting one another! I have to wait until SEPTEMBER to possibly meet Janiece and Anne! Me? Five chocolate cookies and I'm still cranky. That probably means I'd best leave now. I guess I'm getting all meaty - I've spent time with Anne on several occasions, plan on meeting Tanya at Denvention, and will meet Michelle and Michael in September, events permitting. The Smart Man and I probably be in Ohio (Dayton area) for Xmas this year...anyone else going to be in the area? That is the most disconcerting sentence I've read all week. Oooh, Tania coming to Denvention? Cool!